A Kitchen In Brooklyn: Amasea's Kitchen in Sun Valley: What do you think? Amasea's Kitchen in Sun Valley: What do you think? So I've started my canning for the year, and thus far have made only spicy dill pickles and hot sweet mustard pickles (I'll post about those soon). I'm waiting for some additional bulk produce to show up on Idaho's Bounty, and in the meantime I bought 12 pounds of strawberries from Costco yesterday. 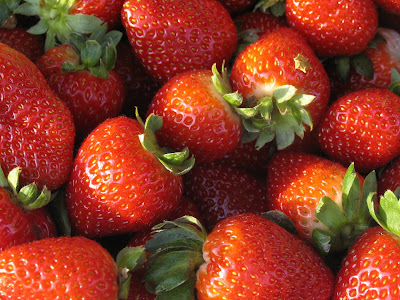 I'm not certain what I want to make with them, but I know I don't want to make some boring old strawberry jam. Not that strawberry jam isn't delicious, but I have lots of jam in the cupboard already, and want to be more creative. There are some great onions around, and I've been thinking -- strawberry-onion compote/marmalade? Possibly with some hot peppers in? A quick perusal of the internet didn't come up with any recipes for that kind of thing, so I could be onto something not often done before. Which could mean it's a great idea, or a very bad idea.